What is most striking about these performances is not the quality of the performances (it would be hard for such a collection of talent not to kill it), but how Glover challenges the Western notion that music and dance are separate entities, that one accompanies the other. In music and dance traditions of African diasporic cultures a split between music and dance does not exist. In the place of an either/or binary between music and dance exists a collapsed both/and pairing. This aesthetic is on perfect display here, as Glover’s performance is simultaneously music and dance. He is at once a great dancer and a great musician. My two favorite jams are the last two, with Haynes and DeJohnette, respectively. Glover describes the different dynamics between him and the two men. With Haynes there’s a beginning, middle and end, and Haynes is definitely the leader. This is readily apparent. Haynes is as fierce and powerful as ever. In contrast, the Glover/DeJohnette performance has the feel of an old school cutting contest or an evenly matched boxing sparring session. Glover describes the performance as lacking a beginning, middle and end; rather, it’s more of a situation in which both men offer their best shots and respond in kind, kind of like: “that’s nice, but check this out.” To my ears and eyes, it was a draw, with neither party besting the other. What I’d suggest when experiencing this DVD is not only to watch, but to listen with closed eyes, especially during the last two jams. What you’ll find is that Glover is not only a great dancer, but that he also has amazing ears, and the great sense of time, rhythm, phrasing and musicality as the best jazz musicians. 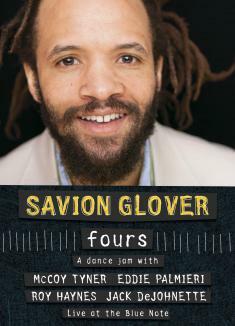 Glover is both a dancer and a musician, calling into question long held ideas in the western traditions about the relationship between both art forms.